If your company relies on several Microsoft Server technologies you know how hard it can be to get your head around all the backups you need to perform to keep your organization safe from computer failure or user error. 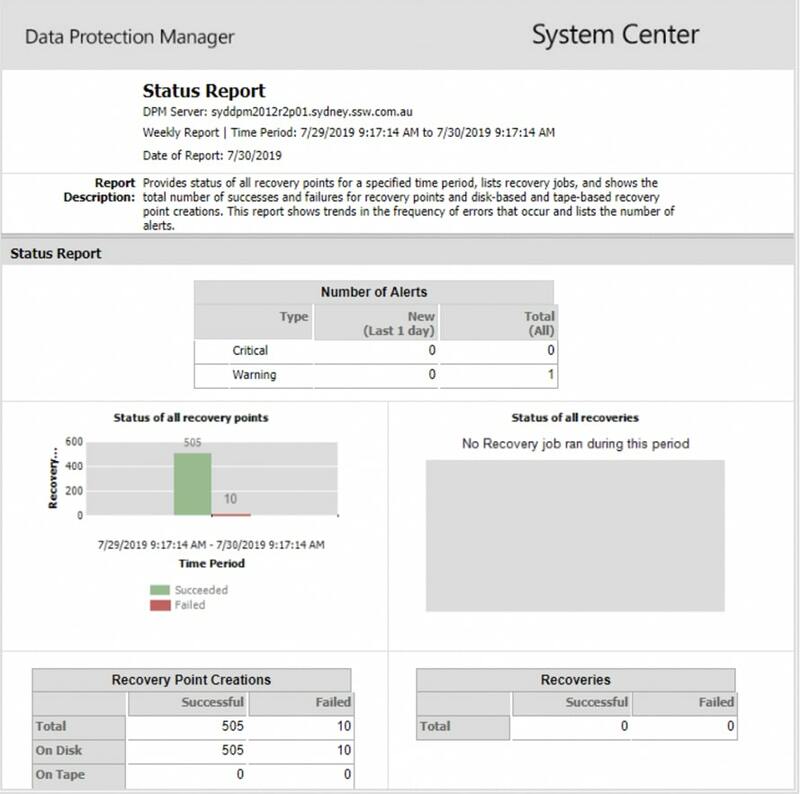 Microsoft System Center Data Protection Manager can take the stress and management overhead out of backups by allowing you to control all your backups from one central console. At SSW we use DPM to protect all our internal SQL Databases, Exchange Servers, SharePoint servers and File Servers - this means that you can trust our consultants have firsthand experience with installing, configuring and maintaining DPM solutions. What data can I protect with DPM 2010? How do I know DPM backups are working? How can I take my data offsite? How do I restore my data in the event of a disaster? SSW can configure DPM's in build reporting, based on SQL Reporting Services. You can be sent you email each day to give you a status of your backups so you don't have to manually check on the DPM server. This is great for management who want to ensure their backups are working correctly. There are two ways with DPM to take your data offsite - creating a simple Disaster Recovery Plan. DPM provides several options for restoring data, including to the original location, a backup drive or tape. It provides a very easy to follow wizard for restoring your data. SSW can provide assistance in helping you restore your data to its backup up state in the case of an emergency. For 20 years we have been servicing: Sydney NSW, Melbourne VIC, Brisbane QLD, Canberra ACT and Adelaide SA. Find out if Microsoft System Center Data Protection Manager is right for your business. Call us on +61 2 9953 3000 to get started!